We’d love your help. 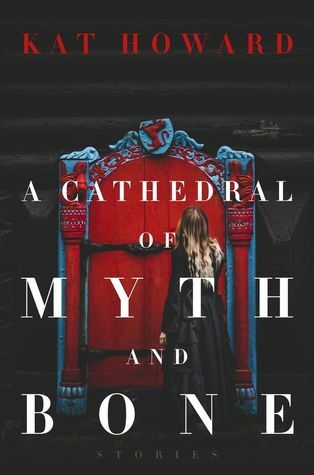 Let us know what’s wrong with this preview of A Cathedral of Myth and Bone by Kat Howard. A woman being written into her boyfriend’s fiction is at first flattered to be his muse, but then finds her real life literally consumed and overtaken by his. A desperate young woman makes a prayer to the Saint of In these sixteen exquisite stories Kat Howard deftly weaves in and out of the countries of myth and hagiography to write the lives of women untold and unexplored. To ask other readers questions about A Cathedral of Myth and Bone, please sign up. All of these stories revolve around myths and legends and thus have a common theme of storytelling interwoven throughout all of them. Every story is set in our world, but not quite. It’s our world but deconstructed and mixed with symbols and aspects of different stories. There’s also a common theme of a story being retold through time – always being the same, but also always changing and evolving and I loved that. All of these stories have women in the center and all of them involve women losing and reclaiming agency in some form or the other. And this is sort of a linear trend – the first couple of stories women lose themselves and their narrative, and as the collection progresses forward, we see them reclaiming their place. It’s incredibly clever and incredibly well done. I was in awe with some of the stuff that Kat Howard managed to pull in these stories and I was so impressed by her craft and the way she constructs these narratives. On top of all that there’s also a sense of grandeur and urgency in these stories. They feel epic and otherworldly, but also really well grounded in our world and they have meaning that surpasses the stories themselves. I just cannot praise the subtlety of the storytelling in A Cathedral of Myth and Bones. Moreover, there isn’t a single “bad” story in here. None of them felt like fillers. Sure, I did like some less and some more, but there wasn’t a single one I did not like, which is saying a lot. A girl keeps getting written into stories by her ex-boyfriend – but she lives in them and starts losing herself and her real life for the stories. It’s scary and also captivating at the same time. Loved this one and it’s a great opener for the collection because it really sets the tone and highlights the central themes of the collection. A girl, desperate for help, prays to the saint of the sidewalks, only to be made into a saint herself. A really intriguing concept that manages to explore being put to a really high standard, having power you did not want and not knowing how to really use it. It’s such a great and clever story. A retelling of the King Arthur legend, where students take on the roles of people from the myth, only for real life to start mirroring the story and vice versa. This is my absolute favorite story in the collection and I think the main one that inspires and grounds all others. It’s unbelievably smart and unique, and goes above and beyond the myth itself and manages to deconstruct it in really clever ways. It’s a fantastic exploration of human nature, the way we experience stories and how they manage to track and follow us through time. And I would easily read a whole book based on this story. A story which is based on the fact that everyone carries their own curse and what happens when those curses are broken. This one is gorgeously written and is so clever in dissecting what a curse can mean for someone and also tackles gender norms in a really interesting way. Really enjoyed this one. A woman gets unwillingly brought back to life by her lover, and her memories of how she died are hazy. Again, a super smart story that puts women and violence in the center and gives said woman her agency back. I really adored this one and I love that this is a running theme of the collection. A story that revolves around a sword-for-hire that settles disputes between people with her sword in duels. I think this would make a great full length novel, and it’s my second favorite story in the collection. It does some really interesting things with saints and sainthood again, but also tackles subjects of science and religion and it’s beyond amazing. Truly. A woman becomes a model for a photographer in his fairy tale shoots, only to start changing the stories. Again a really interesting way to handle women reclaiming agency and the way we can change the existing narratives. It’s a fantastic end to a fantastic collection. I love Kat Howard's short stories, so of course I also love this collection. I'd read many of the stories before, but a stand out new one for me was Once, Future, and Authurian retelling set on a modern college campus. It's so excellent. And then a favorite of mine that I'd already read is The Saint of the Sidewalks. I actually enjoyed it even more this time than the first. Kat Howard's stories are steeped in Catholicism, fairy tales, and female empowerment. You can tell she treats each story wit I love Kat Howard's short stories, so of course I also love this collection. I'd read many of the stories before, but a stand out new one for me was Once, Future, and Authurian retelling set on a modern college campus. It's so excellent. And then a favorite of mine that I'd already read is The Saint of the Sidewalks. I actually enjoyed it even more this time than the first. I had a difficult time deciding between 3 and 4 stars. I chose 4 because ultimately the great stories in this anthology outweighed the not so good. And none of the stories were bad, but I just didn't understand some of them because they were so unique and out there. Also, a few were good stories, but the subject matter wasnt interesting to me. For example, the main novella was about Camelot, which I have never been very interested in. I really loved the prose and magical imagery in these short st I had a difficult time deciding between 3 and 4 stars. I chose 4 because ultimately the great stories in this anthology outweighed the not so good. And none of the stories were bad, but I just didn't understand some of them because they were so unique and out there. Also, a few were good stories, but the subject matter wasnt interesting to me. For example, the main novella was about Camelot, which I have never been very interested in. This fascinating and varied collection of short stories (and in one case a series of vignettes that form a novelette) by Kat Howard is actually the first time I've read a good bit of this author's work. Many of these tales are memorable re-envisionings of stories from literature or history, such as Arthurian legends (what's in a name?) or a modern Joan of Arc (looking for miracles in an urban setting, with the aid of Chanel Vamp and the back of a Stoli box). While I felt varying levels of engage This fascinating and varied collection of short stories (and in one case a series of vignettes that form a novelette) by Kat Howard is actually the first time I've read a good bit of this author's work. Many of these tales are memorable re-envisionings of stories from literature or history, such as Arthurian legends (what's in a name?) or a modern Joan of Arc (looking for miracles in an urban setting, with the aid of Chanel Vamp and the back of a Stoli box). While I felt varying levels of engagement, some like "Maiden, Hunter, Beast" took my breath away, and others like "Murdered Sleep" haunted my thoughts, while "The Green Knight's Wife" had me shivering. This anthology has certainly whetted my appetite for reading more of Howard's fiction! This could have been a 4 stars collection but for some reason I hit a wall with it and it took me weeks to feel like coming back to it. Something along the way made me lose interest, but I can't say what--it might not have been the book itself. I'm also realising that I dislike novellas/novelettes in my short stories collections. To me, they cut the flow. I skipped both of them, though I know I'll come back later to read them. I did love several of the stories, especially the ones about saints. F This could have been a 4 stars collection but for some reason I hit a wall with it and it took me weeks to feel like coming back to it. Something along the way made me lose interest, but I can't say what--it might not have been the book itself. I'm also realising that I dislike novellas/novelettes in my short stories collections. To me, they cut the flow. I skipped both of them, though I know I'll come back later to read them. I did love several of the stories, especially the ones about saints. My favorite stories were probably A Life in Fictions, Saints' Tide, and The Saint of the Sidewalk. One of my new favorite books, and certainly my favorite short story collection to date! I would recommend this to literally everyone, but especially those that understand that fairy tales, legends, and myths deserve to be told not just for their magic, but for what they reveal in our individual realities. ‘So religion fixes everything? Not likely,’ Nora said. “This is what it means to break your own curse. It means knowing what the curse is. Not how it manifests, not why it fell upon you and not upon some other, not what people say it means, that such a curse has chosen you. It means seeing it truly, recognizing the truth at its red and bloody heart. “Cartography, the making of maps, is based on the idea that we can model reality. When it comes to a map, the reality being modeled is usually some kind of physical location. I looked at the room I sat in, covered with Aoife’s maps. Maps that modeled no reality, except the one she wanted them to have, the river Lethe as red thread connecting the pieces. Maps to places she imagined into being. Maps to the places we once were. A pile of maps, purgatory burnt through, erased from existence. You could go anywhere, so long as you had the right map. I picked this book off a shelf because I was intrigued by the title. I flipped to the first story, read the first line ("He wrote me into a story again"), and then stood rooted in the bookstore aisle until I'd finished. I bought the book thinking that one story alone was worth the price and was not disappointed to find the other fictions contained just as much heart, just as much brilliance, just as much potential to make fantasy real. "A Life in Fictions," that first story, is a masterpiece, bu I picked this book off a shelf because I was intrigued by the title. I flipped to the first story, read the first line ("He wrote me into a story again"), and then stood rooted in the bookstore aisle until I'd finished. I bought the book thinking that one story alone was worth the price and was not disappointed to find the other fictions contained just as much heart, just as much brilliance, just as much potential to make fantasy real. "A Life in Fictions," that first story, is a masterpiece, but equally worthy of note are the stories "Returned" (a modern version of the Eurydice story told from her perspective where the man succeeds in bringing her back from death against her will) and "The Green Knight's Wife." I enjoyed this, and I think Howard did some fun things with retellings, but overall it was a fairly one note collection. No complaints, but I won't be thinking about these stories three weeks from now. This review has been hidden because it contains spoilers. To view it, click here. Collection of short stories that range from 10 pgs to 130! Topics include a variety of fantasy, traditional stories retold in modern times and sci-fi. I need help determining the genre (traditional literature or fantasy) - NOt appropriate for middle school, mainly b/c of language in unnecessary and sexual innuendos. A Life in Fictions- female muse gets written into the stories her lover composed and loses pieces of herself bit by bit in each piece. Eventually she gets lost in a white room when he Collection of short stories that range from 10 pgs to 130! Topics include a variety of fantasy, traditional stories retold in modern times and sci-fi. I need help determining the genre (traditional literature or fantasy) - NOt appropriate for middle school, mainly b/c of language in unnecessary and sexual innuendos. Message- careful that you don’t sacrifice too much of yourself for others. Be true to yourself. Once, Future- Camelot- King Arthur, Morgan, Guenivere - Servern college grad students take a course with Prof Link. The discussion of Lancelot leads them to an experimental lesson. They are assigned random characters and jot down notes whenever their lives mirror the story. When fantasy crosses over to reality the different versions of King Arthur’s story are reviewed and students have to work together to change the ending of this story. Creative- deep and 120pgs- short story? Translatio Corporis- a cryptic tale of a girls physical form disintegrating for the love of a city. Murdered Sleep- invitations to a masquerade ball in a broken down mansion. Kora knows the rules about asking questions. As guest dies she releases their masks to the sky- hears their dreams. She eventually becomes the invited to the ball. Short stories are not usually my first choice, but many of these ring like bells -- big bells, with both bass notes and silver cling-clinging that I still hear days after I closed the book. Kat leaves quiet gifts in the pages too: little coins, little crumbs to follow, like little messages written with a fountain pen on a torn piece of paper, dropped. One of these had me sending text messages at 12:30 AM, wondering if what I suspected was true. Kat Howard is about the business of the numinous an Short stories are not usually my first choice, but many of these ring like bells -- big bells, with both bass notes and silver cling-clinging that I still hear days after I closed the book. Kat leaves quiet gifts in the pages too: little coins, little crumbs to follow, like little messages written with a fountain pen on a torn piece of paper, dropped. One of these had me sending text messages at 12:30 AM, wondering if what I suspected was true. Just not to my taste, not at all. Well, OK, I liked the Saint of Sidewalks a bit. The intro felt pretentious to me, and as it turned out so did the stories. As if KH was trying so hard to craft Exquisite Stories that she lost sight of the "Tell Me A Story" aspect. Things happened not because they HAD to happen in the circumstances, but because they added a "hey, watch this bit of writing!" I especially disliked the long yet-another-take-on-the-King-Arthur-theme, of which we have surely seen enou Just not to my taste, not at all. I especially disliked the long yet-another-take-on-the-King-Arthur-theme, of which we have surely seen enough retellings. The novella "Once, Future" where the story of King Arthur plays out on a college campus is probably my favorite piece in this collection. On the while, I found the collection to be a bit of a mixed bag. I think in general I probably like Kat Howard's longer works more than her short stories. I found her novels "Roses and Rot" and "An Unkindness of Magicians" (published elsewhere -- not in this collection) to be quite engaging. But I liked some of the short stories and found "All Our Past Places" The novella "Once, Future" where the story of King Arthur plays out on a college campus is probably my favorite piece in this collection. On the while, I found the collection to be a bit of a mixed bag. I think in general I probably like Kat Howard's longer works more than her short stories. I found her novels "Roses and Rot" and "An Unkindness of Magicians" (published elsewhere -- not in this collection) to be quite engaging. But I liked some of the short stories and found "All Our Past Places" and "Saints' Tide" to be standouts. A number of these stories were excellent, and I enjoyed the themes of location (the cathedrals of the title crop up regularly), myth, feminism and the thin line between reality and fantasy. Unfortunately, the story I enjoyed the least was the longest (by far), dominating the book and therefore my enjoyment of it. It felt rushed and superficially explored, and without it, I would have rated the collection higher. Still a very solid read, and one I would recommend. 3.5. “Once, Future” is damn good and gets 5 stars, easily. I also really enjoyed all the stories that incorporated saints, and I very much appreciated the active conversation about and with the nature of fairy tales and stories. It’s just that at the end of most of the stories, I felt a little let down, as if something interesting had been half-formed and then abandoned. She’s a beautiful writer, though, and I love where her head’s at. What a brutal, unsettling, and poignantly mythic collection of stories. Personal faves include “Translatio Corporis” as well as “Dreaming Like a Ghost” and “Returned”. So damn good. If you’re a fan of Neil Gaiman or Aimee Bender—and always imagined what some mix between the two might look like—this collection is for you. A haunting and gorgeous collection of short stories threaded together with the quiet opulence of a stained glass window. Howard's beautiful prose brings together fragile bones, feathered pages, and heartsick saints. It's worth mentioning that Once, Future is my favorite King Arthur story since The Once and Future King-it's that unbelievably good. These stories were incredible; I love the imagery and the descriptive language and the glimpses into folklore. Each story is evocative and I am amazed by how well the traditional fantasy and fairy tale elements intertwine with descriptions of contemporary society. I especially loved Dreaming Like a Ghost, Returned, and Maiden, Hunter, Beast. Some of the short stories in this book are fantastic. The novella update of the King Arthur story was lovely and dreamy. As sometimes happen in short story collections, the strongest stories were clustered in the front, and then some of the later stories seem almost unfinished. But they are all worth reading! For adults or older teens. I am completely and totally in awe of this new collection of short stories. These tales are as dark and beautiful as the myths and fables they are based on, but somehow they seem impossibly richer. Howard has breathed new life and modernity into everything from Greek mythology to the tales of Camelot. Impeccably executed and perfect for fans of fairy tales, myths and magic! I really love Kat Howard's work and whatever fantasies and fairy tales fed me as a child clearly nurtured her as well because her writing really speaks to me. Once, Future was, ugh, such a good gut-punch. Short stories aren’t usually my thing, but these have a completeness about them that’s satisfying. I loved the undercurrent of saints lives and references to myths, plus the centering of female protagonists taking agency over their stories. Wow! I am not usually a short story person, but this was chockablock full of wonderful and terrifying woman-centric magic and modern mythology. Most of the stories I loved (especially "Once, Future"), just one I thought was just ok, but all haunted me and left me wanting more. With Ms Howard's fabulous writing, I would recommend this book for everyone. While I didn't love all of these stories, the ones I did love were fantastic. The writing is lyrical, and although the stories are mainly based on mythology, they're quite unique in their delivery. On the list of books I wish I had written. What a wide ranging collection of stories! I loved all of them. Also, Shane Leonard took her photo, and she's super grateful.